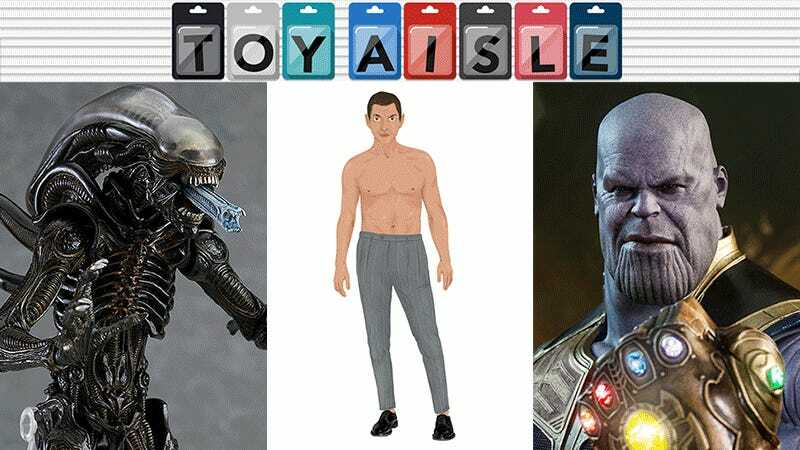 Welcome back to Toy Aisle, the regular io9 column where we rate the latest toys and merchandise out of a 10 possible Goldblums. This week: Hot Toys unleashes not one, but two Infinity War figures, Lego brings in Gold Squadron for a bombing run on your wallets, and more. Take a look! Like the massive, $800 Millennium Falcon Lego released last year, the toymaker’s new UCS Y-Wing Starfighter is actually an updated version of a set that originally hit stores back in 2004. The new version ups the piece count from 1,485 to 1,967, which means there’s slightly more detail on this model, plus a fancy, silver R2-BHD astromech droid. Like its predecessor, the Y-Wing has retractable skids, rotating ion cannons, and an opening canopy, plus a display stand with a fact sheet for display. It will be available starting May 4th for $200. Standing just over 16 inches tall, Hot Toys’ new Avengers: Infinity War Thanos is one of the toymaker’s largest sixth-scale figures to date, and it certainly does justice to one of Marvel Comics’ most infamous baddies. For $376 you get swappable hands and arms for striking your preferred pose, and some impressively-detailed armor. But as accessories go, Hot Toys’ Thanos comes with not one, but two of the most coveted weapons in the universe. Both versions of Thanos’ Infinitely Gauntlets light up thanks to LEDs hidden inside, but one comes with a clenched fist pose, while the other features articulated fingers for pointing out which Avenger is probably going to die in the movie. Jeff Goldblum has always been one of Hollywood’s priceless treasures, but his recent turn in Thor: Ragnarok made it one of the best Marvel movies to date and helped remind the world why we need more Goldblum. If you can’t wait for his next big screen appearance, this Jeff Goldblum dress-up set from Belly Kids will help tide you over. Featuring laser-cut, vinyl-covered magnets, the $14 set features Goldblum’s outfits, costumes, and styles spanning his entire career, from The Fly to Jurassic Park and right up to Ragnarok. If there’s a silver lining to the bleak morning full of fraud and lies that is April Fools’ Day, it’s ThinkGeek’s prank products. They’re clever, well-executed, and occasionally get turned into real products. Remember the Tauntaun sleeping bag that you can actually buy now? The same thing has happened with last year’s Tentacuddle blanket prank. Who among us hasn’t curled up on the couch with a blanket, only to lament that it doesn’t make us feel like a mermaid, giant squid, or kraken? For $60, this woven blanket gives you five tentacles, covered in faux suckers, to help warm your various appendages.